In 2013, the Australian poetry scene was rocked by a number of high-profile instances of plagiarism. The poet Ira Lightman, who unmasked several perpetrators, debates the underlying issues with poet and critic Anthony Hayes. Until the revolution, there will probably still be some form of mainstream lyric poetry within an underfunded system. There will also be poetry competitions. 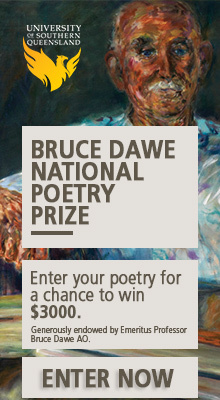 Personally, I don’t like many prize-winning poems. Prizes are for gathering income for a poetry magazine or organisation. The prize money is likely set at a rate less than the total entry fees of all entrants, plus administration and publication costs. Poets don’t learn to write better poetry by reading the winning poems (although they might by reading a whole book by a winner). Poets hope to win a competition to publicise their name – and fair enough. Though only a certain kind of poem wins poetry competitions, the allegation (made by some) that most of the instances of plagiarism uncovered in 2013 were placed in poetry competitions is untrue. It is not the case, either, that plagiarists have generally taken poems that won other poetry competitions and won new competitions with them. These are just the cases (within plagiarists’ careers) on which the media have picked up. These instances are probably nearer to illegality, because money has changed hands under false pretences. Poetry competitions are not for exercises in postmodern repositioning of collaged text. Only a fool would misread all the signs around them and think that doing so was okay. But the greater financial benefit to a plagiarist (and his or her unfair advantage over writers who declare their sources or who write in their own words) comes when they build a long-term career by amassing magazine publications via plagiarisms. Magazine publication is the route to book publication (poetry people always look inside the front cover for the note ‘some of these poems were previously accepted for publication by …’). This statement indicates the poet has paid his or her dues; it indicates professionalism. A published poet can start applying for time-to-write grants, travel grants, opportunities to be a visiting poet in schools or a creative writing lecturer. In an ideal world, these would be accorded to fund the best work that could be written, work that would not otherwise have been produced without funding. The opportunities would be given to the people who can teach and inspire poetry best, even if they don’t write it best. But they aren’t always – there are plenty of (non-plagiarising) poets who teach badly and who are funded to write forgettable work. So why should one care about corruption within corruption, specifically in the form of plagiarists winning? One answer is that we should clean up corruption wherever we find it – and we have to start somewhere. Another is that any form of corruption inevitably weakens the context in which it takes place, in this case Australia’s small but vibrant poetry scene. Plagiarism is wrong mainly because it’s cynical. By ‘plagiarism’, I mean passing someone else’s work off as your own, as opposed to doing work that involves (signalled) collage and quotation. As when someone says ‘only kidding’ when they aren’t, nobody really buys the excuse that most plagiary cases are deliberate experiments. It’s not Ern Malley, because it was not played like Ern Malley. With the recent cases, there were no hidden clues, no set-ups for the jokes – and they went on too long. I believe in demystifying literary culture. I think the best writings are the ones that are written best. I think that you can teach creative writing if there is a true relationship between learner and teacher: if the learner seeks out a teacher whose advice they want and if the teacher behaves ethically. But instead of that, we have a lot of beginner writers sending out beginner work and bombarding editors and teachers (instead of working on and treasuring and paying for the advice they seek). And so editors and teachers and successful writers become cynical, accepting recommendations via the social circles in which they move and doing things for favours – and expecting favours in return. As a result of this false ‘happy families’ atmosphere, people in writing circles often hush-up or trivialise reports of plagiarism. It becomes abundantly clear that such and such powerful person doesn’t like talk of plagiarism, and so one avoids the topic, as if it’s an anti-social conversation. (Never mention money, politics, religion or plagiarism!) Established figures who ought to explain openly why they’ve plagiarised are allowed to retreat by friends standing up for them, friends who are quite happy to let the plagiarist disappear without trace if the situation gets too bad. So, who does this culture of silence and denial affect? Generally speaking, it affects people’s ability to ask crucial questions. How was this writing written? Has this poet gone off the boil? What do I think about his or her work (and/or teaching)? But it also affects talented beginners. A year before any of the recent plagiarism scandals broke, a young poet approached me because she had shown her work to a senior poet (after he requested to see it). Imagine, if you will, a seven-verse poem about meeting your father whom you’d never seen. In verse one, they meet in London, and it’s the first meeting, and rushed. In verse two, it’s the second meeting, in Cambridge, and he and she exchange gifts. In verse three, they’re in Liverpool, and they argue. By verse seven, they part ways, and then the father dies. This was the younger poet’s poem. It was a great idea that allowed the poet to pace the unfolding narrative. The younger poet was surprised a few months later when she opened a poetry magazine and found the senior poet’s poem about meeting his long-lost mother in seven northern towns. In verse one, they met in Morpeth, and it’s the first meeting, and rushed. In verse two, it’s the second meeting, in Rochdale, and she and he exchange gifts. In verse three, they’re in Birkenhead, and they argue. And so on. The northern towns were lovingly described, perhaps with better vocabulary and word-music than in the younger poet’s work. But the poem was blatant theft. It was written with a kind of blithe assurance that the basic idea was just one of the brilliant things that come to brilliant senior poets without breaking a sweat, whereas in the younger poet’s poem, one could feel the effort, the twitch of rapid eye movement. The younger poet confronted the senior poet. The senior poet simply denied there was anything wrong. He said it was a different poem. Now, there was another case with the poet Roger McGough some years ago where he’d read a published poem by Jenny Lewis, who had been a student of his, and then wrote to her sending her his own version of her poem. In printing it, he credits her poem. Although she would like him to credit her every time he performs, he has acknowledged the debt. But the senior poet in my example simply brazened out a situation, in which, if the two poems were laid out side by side, the theft would be obvious and outrageous. Yet, it’s seen as bullying to expose him. It’s also risky, because he has some power in picking people for poetry-related jobs. I can’t expose him because I don’t have the younger poet’s permission. My attempt to expose Graham Nunn met with opposition – not just because Nunn had strong personal relationships with other poets, but also because an entrenched culture was in place. I threw myself into plagiarism research with this senior poet in mind. I was told that plagiarists never plagiarise just the once, and my research has shown that to be true. I know of one other case of the senior poet doing just the same thing to a less established poet and I’ll bet there are others. It is completely unacceptable. It demoralises beginner poets. It makes them not try. It makes them give up – and all so this senior poet can feel comfortable. That’s bullying. Plagiarism is a widely used method for creative production. It is, however, more often associated with theft, the absence of creative effort and, crucially, the dissimulation of such methods. By openly declaring the use of plagiaristic methods, we can not only overcome the pejorative regard in which plagiarism is often held, we can also begin to explore the creative potential of such methods. What is most striking about the recent cases of Graham Nunn and Andrew Slattery, apart from their attempts to disguise or deny their plagiaristic methods, is the relatively unimaginative and self-interested ends to which they deployed such methods. William James once argued that the criteria for the truth or the value of an idea should be found in the idea itself, not in its origins. We can fruitfully use this approach when judging the use of plagiaristic methods, assessing the worth of the result rather than condemning the method of production. The fate of the poems associated with the Ern Malley hoax of the 1940s illustrates this. Concocted by the poets James McAuley and Harold Stewart, the poems were designed to humiliate and disgrace Max Harris and other artists associated with the Angry Penguins magazine. More generally, their target was the artistic modernism that was in the ascendant in the wake of the Dada and Surrealist movements. Nonetheless, despite the poets’ intentions, the Malley poems proved more startling than anything written ‘seriously’ by McAuley or Stewart alone. Using methods that they believed were in themselves inadequate for the production of art – for example, plagiarising ‘found’ material and rapidly working up the material without the toil often associated with great art – these first-class poetic bores proved capable of collaboratively producing remarkable poetry. The now widely acknowledged worth of the Malley poems demonstrates that the methods by which they were composed are no more or less valid than any other methods of composition. Plagiaristic methods can produce great works as easily as dross. Some have compared Nunn’s and Slattery’s plagiarisms to that of the Malley hoax. While plagiaristic methods were common to all, the motivations of the plagiarisers were critically different. For McAuley and Stewart, the motivation was the humiliation of Harris, his artistic clique and the Angry Penguins; for Nunn and Slattery, it appears to be of a more pecuniary variety and perhaps even the allure of fame (as far as that goes in the small poetry scene). What is striking about Nunn’s plagiarism is his ineptness. He appears to be satisfied with minor changes to the original material, and often no changes at all. Indeed, it is hard to judge his poems apart from their source simple because they are so similar. Slattery’s work appears to have required more finesse, often drawing on multiple sources in order to construct new poems. Nonetheless, he produced curiously flat pieces: his juxtaposition of so many poetic fragments is overwhelmed by the absence of an overarching coherence. Yet he won awards, and this is what appears to have mattered both to Slattery and many of his critics. The concept and practice of ‘plagiarism’ can be usefully situated in relation to the private property norms of capitalist society, and the often confusing relationship between individual creation and the social nature of individuality. In the case of the Malley hoaxers, it was a method to be lampooned and ultimately revealed so as to better drive home the malicious intent of the ruse. In the case of Nunn and Slattery, it was a method to be hidden. Let’s now turn to a group who openly avowed plagiaristic methods as an essential part of a revolutionary anti-capitalist practice: the Situationist International. In the 1950s and 60s, Guy Debord, a founding member of the Situationist International and author of The Society of the Spectacle, argued that plagiaristic acts, particularly those of the artistic avant-garde, revealed the weakness of capitalist notions of creation and ownership. Following the work of the nineteenth-century writer Isidore Ducasse (aka the Comte de Lautréamont), Debord and one-time collaborator Gil J Wolman systematised the ideas and practices of Ducasse, the Dadas and the Surrealists under the term détournement (from the French verb ‘détourner’ which can mean ‘to divert’, ‘to detour’ or ‘to hijack’). In essence, the theory of détournement was an attempt to defend such acts from the ignoble rubric of ‘plagiarism’ and in doing so destabilise the rule of private property and the cult of the individual genius. For Debord and the Situationists, détournement was the truth of all creative practice, whether we consider the formal practices of avant-garde art in the twentieth-century, or the longer-term history of human creation as a social process. Certainly, the practice of collage and the use of ‘found’ objects in the pictorial and literary works of the early twentieth century avant-gardes were new techniques made possible by the development of capitalist mass culture in an age of mechanical reproduction (for example, books, magazines, the cinema and so on). Such developments were underwritten by the increasingly social nature of mass production and consumption. Thus we find, particularly in the Dada and Surrealist movements, that the peculiar conditions of modern industrial alienation are simultaneously the source of these new materials and the object of criticism. Debord did more than theorise détournement: he practised it as well. In his films and writing he deployed détournement not only to create new assemblages, but also – and crucially – to develop a critique of capitalist society. A striking early example was the sandpaper-bound book Mémoires, first published in 1959. A collaboration with painter and fellow Situationist Asger Jorn, Mémoires tells the story of the formation of the Letterist International, the group Debord helped found before the Situationist International. The text Debord wrote was ‘composed entirely of prefabricated elements’ – that is, they were plagiarised from books and magazines. Debord deployed similar methods in his film work, mixing found footage with occasional newly shot material. His plagiarism was always deployed to critical and creative ends. Debord never tried to pass off others’ work as merely his own – rather, the work of others was transformed under his hands, diverted to tell a new story, or even to criticise or extend the work plagiarised. The crucial point of rebranding plagiarism as détournement is to criticise the capitalist ideology of individual creativity and make explicit the social nature of even the most intensely individual creation. As Karl Marx once commented, we are individuated in the midst of society; so, too, do we create as social individuals. Our collaborative practices can be more or less direct, more or less conscious, but they are there in our shared languages as much as our deliberate acts of cooperation. If we are to find fault with Nunn, Slattery and their ilk, it must be with their concessions to the myth of individual genius and the ideology of capitalist property. Their dissimulation of plagiarism is their greatest failing and the source of the poverty of their plagiarism. By openly avowing plagiarism and détournement we reject such paltry efforts and take aim at the real problem: capitalism. Poets – one more try if you want to be plagiarists! Poets keep talking their opposing rhetorics of ‘form will change the world’ versus ‘authenticity from within’. The trouble in all politics is the recycling of rhetoric that doesn’t persuade anymore – when the left-winger can’t say ‘socialism’ and the right-winger can’t advocate increased taxation. I myself use lots of quoted and collaged material (cited and footnoted) and I try to follow Ezra Pound’s idea of rewriting for greater clarity, colloquial power, passion and new context. I’m sympathetic to Anthony Hayes’ idealism about using collage and rewriting, but I find him vague – and this is why. Debord’s Mémoires is an arty book. Look up images of it: text at all angles, paint splashes like a damaged, exploited and abandoned factory. It’s an arty objection to the writing world’s smooth des res cleanliness. Because, after all, many get excluded in this world. Neat rows of ‘proper’ language are often stuffy. They seem like school – and if you work with kids, you soon realise schools turn many off language. Some learn that they’re ‘good’ at language, while many others learn to be embarrassed and feel inept. Nobody talks about content much. Arty is nice, but the art world isn’t perfect. It is snobby to the visually illiterate. And it’s a world that often refuses to use an editor to advise on phrasing. The editor, a cursed breed, is one of the least funded, most endangered personnel in publishing now. One could say capitalism doesn’t want clarity. People don’t edit closely. They hand in a piece of writing and hope they’ve gotten away with it. It’s naive to think that we live in a culture where we can take up any text, forget its origins and improve it. People don’t. They don’t really care about the whole architecture of a written piece, let alone whether the ideas hang together. Even poets routinely avoid giving honest feedback, except behind each other’s backs – and then it’s usually snippy rather than constructive. Generally speaking, how good is rewritten work? Pound’s rewritings are masterful, as is his ear for placing one line (from one source) next to another (from a different source) next to his own thinking-aloud. Pound absolutely wanted to change the world. The case of CJ Allen, who has been labelled a ‘plagiarist’ but is a very talented writer for his phrasing, is different. Allen did some ‘writing through’ others’ poems, and initially signalled, fairly clearly, that he was doing so. He would take a poem’s end words, then write a new poem with these. Sadly, almost nobody noticed or seemed to care or offered praise. After a while, Allen stopped saying ‘after Ashbery’ (or whatever) at the top of the piece. In at least one case, he entered a competition with a ‘writing through’ poem without saying that’s what he was doing. And this finally made the news. Allen’s jump-the-shark move was to take the books of one poet, Matthew Welton, and start ‘writing through’ lots of them, with no acknowledgement at all. He even sold poems to Welton, in person. He could have declared what he was doing and he didn’t; Welton had to discover the borrowings while leafing through the pages. Welton responded with hurt and emotion, typical of the air of wide-eyed discovery generally in his work. Some say Allen’s poems using Welton’s end words were better than Welton’s originals – less flowery and crisper. I’d disagree. Allen’s have no botany. They are as downbeat and pessimistic as any poem by the Eeyore of poetry, Philip Larkin. Allen’s poems are almost always deadpan, and often place hope and a sort of elite wisdom in the art world. They speak about capitalism as overbearing, but are in themselves cynical, albeit wistfully cynical. I’d say similar about the work of Nunn and Slattery. People doing reworkings, openly and credited, would be great. It’s similar to editing: it’s an honest response. As Bob Dylan sings, ‘To live outside the law you must be honest’ – which, incidentally, is not his line: ‘When you live outside the law, you have to eliminate dishonesty’ is from the 1958 film The Lineup. It is always good to find an apparent opponent agreeing with a great deal of one’s argument. Ira Lightman agrees, in effect, that I am right to distinguish the open plagiarism or détournement that was practised (unwittingly) by the Malley hoaxers from the closed or deliberately hidden plagiarism of Nunn and Slattery. Further, he effectively agrees with my representation of the practices of Nunn, Slattery and their like as self-interested, though preferring the adjective ‘corrupt’. Indeed, Lightman paints a grim picture of the mainstream poetry scene (the scene centred on influential poetry journals) as utterly corrupted and corrupting, where the material and ‘moral’ rewards – though meagre in comparison to the ostentatious wealth of some sectors of capitalist society – are not inconsiderable, particularly when considering the alternatives (for example, monotonous day jobs, little or no recognition and so on). While I agree with Lightman’s picture of a corrupt and corrupting mainstream poetry scene, we differ in our conception of the nature of this corruption and a solution to such. More pointedly, I believe it is by realising plagiarism, albeit as openly as possible, that we will find the real solution to this sad situation. Lightman rightly speaks of corruption, but he is unable to account for it. In his view, it just is. An apparent fact of existence, so to speak. Such an outlook bodes ill for him, as it effectively reduces his desire for truthful relations between poets (as much as poets and readers) to a mere wishful ideal or unrealisable desire. At one point he even seems to blame those poets trying to crack into the mainstream scene as being partly responsible for corruption, via such nefarious practices as plagiarism. If corruption is truly a brute fact of existence, then Lightman’s police work will be never ending – indeed, such a Sisyphean task would necessarily be self-defeating. Alternatively, if we consider corruption as a contingent and historically explicable fact of life, then we can conceive of it as a problem that not only can be solved, but that also contains the seeds of its own solution. Most obviously, corruption can flourish through seemingly unassailable hierarchies that cherish their material privileges and are loath to let go of such power. Nonetheless, it is through the recognition of the unnecessary nature of such hierarchies, rather than Lightman’s frankly bizarre belief that plagiarism causally contributes to this corruption, that we begin to find a real solution. I believe that a better way to understand corruption is as an endemic and indeed necessary consequence of capitalist social organisation. Such an account is attractive simply because we can understand that a social order that is organised on the basis of the accumulation of property and profit – that is, a hierarchical social order based on unequal access to social power (read: money) – is necessarily corrupt. Moreover, we can account for the historical origins and rise to prominence of a global capitalist order, and in posing its existence in such historically contingent terms we can not only imagine its end, but also – and even better – identify those practices in everyday life that explicitly and implicitly struggle against such a suffocating social order. Plagiarism is such a practice. Ducasse’s notion of plagiarism is the same as my idea of open plagiarism. It is not the mere copying of another’s work for personal gain, but rather the re-use and transformation of other’s words and ideas. Indeed, it is the putting back into play of words and ideas, freeing them from the staid mausoleums of literary canons and scholarly debates. Such plagiarism is steadfastly the enemy of hierarchy, privilege and power. As I have argued, the efforts of Nunn, Slattery and other poets who disguise their plagiarism in search of material and social success are often poorly executed and unimaginative. They also reveal the deeply conservative outlook of the practitioners. This is particularly apparent in Slattery’s case: he attempted to defend his hidden plagiarism as an experiment, but forgot the necessarily transparent nature of experimentation. Indeed, in order to deserve the term, ‘experimentation’ requires a community of practitioners willing and able to engage with, judge and test such experiments. Unfortunately, Slattery’s and Nunn’s works bare a more striking resemblance to dreary pastiches, often evacuating the source of all that was vital and interesting through their minor transformations enacted to cover their appropriations. A step toward countering such corruption would be to openly embrace plagiarism in the way I have outlined. Anthony Hayes is currently writing a PhD thesis on the Situationist International. He also writes poetry and makes films. He blogs at Notes from the Sinister Quarter and works & days of the antyphayes. Ira Lightman is a poet. In his double-column poems (Trancelated at www.ubu.com/ubu) he employs quoted text and translations in collages. He makes public art, organising a community’s poems into visual art. He broadcasts on BBC Radio 3’s ‘The Verb’. He has set Creeley, Gunn, Sward and others to ukulele.